Regardless of the classification, for medical devices coming into contact with either healthy or damaged organic tissue, it is necessary to utilize only the purest and safest ingredients. Gauzes/wipes/plasters/patches: FeF™ Benzalkonium Chloride is often found in solution impregnated gauzes, wipes and plasters for skin and/or wound disinfection at typical concentrations of 0.01 to 0.1%. Skin and wound cleansing: Solutions of 0.01 to 0.1% FeF™ Benzalkonium Chloride (BKC) are typically used for cleansing skin, mucous membranes, and wounds. More dilute solutions are suitable for irrigation of deep wounds. Catheters: FeF™ Benzalkonium Chloride (BKC) can be coated or impregnated to reduce catheter-induced sepsis by preventing microbial colonization, e.g. in central venous catheters coated or impregnated with BKC. Irrigation solutions: Aqueous solutions of 0.005 to 0.02% FeF™ Benzalkonium Chloride can be used for irrigation of the bladder and urethra and 0.0025 to 0.005% solutions for retention lavage of the bladder. Surgical glues (tissue adhesive) are other examples of devices containing FeF™ Benzalkonium Chloride as an auxiliary. FeF™ Quats are effective at all pH levels. However their effectiveness increases when the pH increases. The higher the pH, the lower the concentration needed to obtain an antimicrobial effect. suppliers, and our validated processes are fully controlled to obtain the lowest possible levels of impurities. fungicidal, meaning they will kill micro-organisms, whether they are in a growth phase or not. Some antibiotics under given conditions are more effective than antimicrobials. However, in general, they only work if the micro-organism is in a growth phase, and so cannot be used as an antimicrobial. 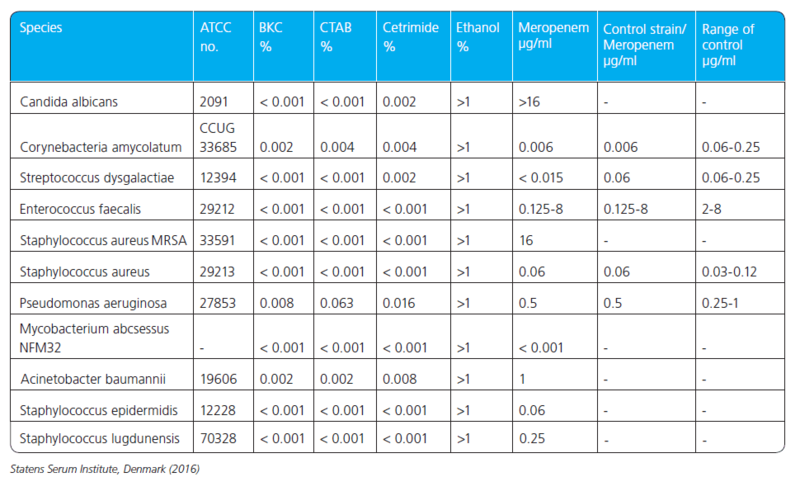 FeF™ Quats have been tested against several relevant microbial strains, and shown to be effective against a wide range of microorganisms at low concentrations. FeF™ Quats are compared here with ethanol and with a positive control containing Meropenem (a broad-spectrum antibiotic).